Malaysias Hauptstadt „KL“ ist multikulturell, vielfältig und sehr fortschrittlich. Anders als in den Emiraten, in denen westliche Modernität und arabische Tradition nebeneinanderher existieren, vermischen sich hier der Islam und dessen Kultur sowohl mit dem asiatischen Lebensstil als auch mit dem starken Einfluss der Globalisierung. Kleine Wohnhäuser mit einfachen indischen Restaurants drängen sich am Fuße allzeitbeleuchteter Wolkenkratzer, bewohnt von europäischen und asiatischen Geschäftsleuten. In einem solchen wohnen wir, zusammen mit vielen anderen jungen Leuten aus aller Welt, die für eine bestimmt begrenzte Zeit (im Durchschnitt zwei Jahre) hier arbeiten oder ein Praktikum machen. Nach all den einfachen Hostels in Thailand können wir den Luxus, den riesigen Pool und das Fitnessstudio nur für uns, gar nicht fassen. Wir hatten seit sechs Wochen keine heiße Dusche mehr – daran, dass uns das erst jetzt auffällt merken wir, dass wir sie wohl auch nicht wirklich gebraucht haben. Zum Abendessen gehen wir in KLs berühmte Essenstraße „Jalan Alor“, die unter den Top 10 Besichtigungsplätzen der Stadt ist. Nigel, ein Freund aus Neuseeland bei dem wir wohnen, zeigt uns sein chinesisches Stammrestaurant bevor wir uns ins Nachtleben stürzen. Schon in der ersten Bar werden wir von einem Franzosen und Südafrikaner angesprochen und für den nächsten Abend auf eine Party eingeladen. Zusammen mit Leuten aus Neuseeland, Australien, England, Amerika und Holland ziehen wir in den nächsten Club, wo wir erneut angesprochen und auf Getränke eingeladen werden. Wir tanzen und feiern und nach einiger Zeit stellt sich heraus, dass unsere neuen Bekanntschaften keine Geringeren sind als der Neffe des afghanischen Premierministers und sein zwielichtiger malaysischer Freund, der nicht nur der Clubbesitzer, sondern auch Mitglied der Mafia ist. Begleitet von zahlreichen Securitymännern, die jeden seiner Schritte überwachen und sein Glas im Auge behalten, behandelt er uns wie Freunde – dennoch, als wir die Chance bekommen verschwinden wir lieber unbemerkt. Am darauffolgenden Abend fahren wir zu der Feier, auf die wir eingeladen worden sind. Die Residenz ist noch beeindruckender als die in der wir selbst wohnen, mit Pools in mehreren Stockwerken. Auf dem Dach befindet sind ein riesiger infinity pool, der sich ohne Abgrenzung über die Stadt erhebt. Da wir auf einer Party sind haben wir keine Kamera dabei, doch dieser Ausblick ist definitiv die beste Skyline, die wir bisher gesehen haben. Die anderen Partygäste sind aus Neuseeland, Australien, Asien, Europa und Afrika. Sie arbeiten in KL für ein paar Jahre, sind weitgereist und haben allesamt interessante Geschichten zu erzählen. Auf dem Heimweg stoppen wir – nun schon zum dritten Mal – bei Jalan Alor, um mitten in der Nacht zu essen (die Restaurants haben 24 Stunden lang offen). Von der Energie der Stadt belebt schaffen wir es trotzdem am nächsten Tag früh aufzustehen und weitere Orte zu erkunden, unter anderem die berühmten Petronas Towers, ein Shopping Centre mit integriertem Vergnügungspark und „Little India“. Nach vier verrückten Tagen fassen wir zusammen: Kuala Lumpur ist eine sehr beeindruckende und diverse Stadt, die weniger mit touristischen Attraktionen lockt, dafür aber mit weltoffenen Menschen! Tipp für Reisende: Erste Regel in KL: Beim Taxifahren immer über Meter abrechnen, nie einen Preis zuvor ausmachen. Aus Erfahrung können wir sagen, dass egal wie nett der Taxifahrer ist, man immer abgezogen wird (unsere erste Taxifahrt kostet uns 30 Ringgit anstatt 5). Malaysia’s capital “KL” is multicultural, diverse and progressive. Whereas western modernity and Arabic traditions clash in the Emirates, here Islamic culture mixes with Asian lifestyle and Globalisation. Foreigners live in huge, day and night illuminated skyscrapers that tower above small houses inhabited by Indian families that run little restaurants. We as well as many other young people are staying in one of the “residences” that resemble hotels rather than homes. They usually work and live in KL for about two years. After having stayed in cheap hostels in Thailand for three weeks having a private pool and gym is overwhelming, especially the hot shower, which we have not had in six weeks now, is the biggest luxury. Since we are close to downtown we decide to just go out and look for a nice place to have breakfast the next morning. Half an hour later we have still not found anything and both our bellies and moods are very unhappy with the situation when a young man comes up to us, asking us if we need help. We look lost, he says, and there is no breakfast near to where we are, but he could take us to the Central Market. Why not? Off we go and because we take the wrong way about five times (KL’s street system confuses even the Malaysians) we see some of the old parliament houses from back in the day when Malaysia was a British colony. When we get to the market Ali decides to show us around and takes us to a small, hidden restaurant in which we order the biggest plates for only 7 Ringgit (which is about 1,80 Euro). We try lots of exotic fruit – not all of it is good – and drink Milo, Malaysian hot chocolate, while we explore Chinatown and all its crazy and fake products. Afterwards we go to a spa in which fish eat the dead skin off our feet. It is a funny and strange feeling that we cannot really get used to. Even though it is raining season and therefore bad weather we are spending a wonderful day with our new Malaysian friend and are loving KL already. In the evening Nigel, a kiwi friend that we are staying with, takes us to his favourite restaurant on Jalan Alor, Kuala Lumpur’s famous food street. Afterwards we go to a bar called “Pisco” where we meet people from all over the world and promptly get invited to a BBQ the next day by a French and an South African guy. Our group consisting of Kiwis, Australians, an English guy and girls from America and Holland moves on to another club. We dance and party and meet even more people. After a while we find out that they are the nephew of the Prime Minister of Afghanistan and his mate who is part of the Malaysian Mafia and also the owner of the club. Only then do we notice that we are surrounded by security men who are watching him closely, taking care of him and whatever he is drinking. They are very nice to us, want to treat us for food and drinks, but still – as soon as we get the chance we prefer to go home safely. The day after we are on our way to the next party and as soon as we get there we notice that this residency is fancier than ours. 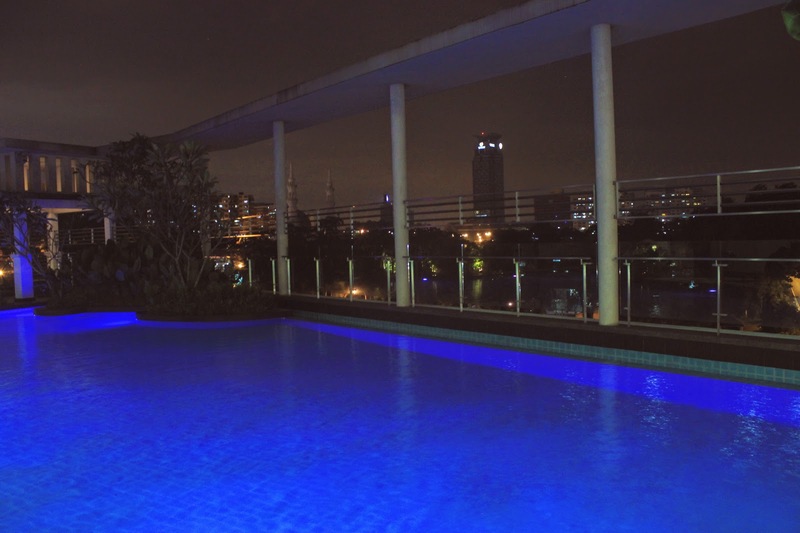 There are pools on several floors and even a big infinity pool on top of the building. When we are up there it is definitely the best skyline view we have had on our trip so far, but since we are at a party we have neither a camera nor phones to take a picture with. The other party guests are from New Zealand, Australia, Asia, Europe and Africa and work in KL for a few months or years. They are well travelled, most of them have lived in different countries and they all have interesting stories to tell us. On our way home we once again stop by Jalan Alor (for the third time) and have a great meal in the middle of the night, since these restaurants are open 24 hours a day. Undeterred by the lack of sleep we get up very early the next day and explore more of the city. We walk to the Petronas Towers as well as several shopping malls, one of them including a theme park, and “Little India”. Kuala Lumpur may not have a lot of tourist attractions, but it is still impressive and rich in variety, especially because of all the different open minded people and cultures! We would like to thank Nigel for hosting and taking care of us as well as Ali for being such a spontaneous and nice tour guide! We had a great time in KL! Tip for travellers: First rule in KL: Always use taximeters, never negotiate a price before. No matter how nice the driver is, he will trick you into paying more (we once paied 30 Ringgit instead of 5).